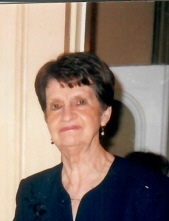 Suzanne M. DeBlock, a lifelong resident of Orange County, died peacefully on March 24, 2019 at Kaplan Residence. She was 91 years old. She was born in Goshen New York to Henry Lutjens and Sara Garabrant on August 8, 1927. She was a devoted and loving wife, mother, grandmother and great-grandmother. She was a gracious, warm and welcoming hostess, a community activist, a member of the Wawayanda Republican Committee, a volunteer for Arden Hill Hospital, Creeden Hill 4H Leader, a lifelong member and trustee of Ridgebury Presbyterian Church, Sunday School Teacher, a strong element of the choir, Slate Hill Pacers member, AHRC fashion show coordinator and productive Avon Representative. Suzanne loved people and took every opportunity to connect with anyone she encountered. For over 60 years, she and her husband, John ran a successful family dairy farm in the Town of Wawayanda. She kept her family nourished with her cooking skills, encouraged them with her faith, and showered them with her love. She created a strong family bond that will live on forever. Her proudest accomplish in her life were her 8 children, who brought joy to her daily and survive her. Nancy Lust and her husband Henry of Middletown , Gloria Jean Squire and her husband Jim of Atlanta, Georgia, Linda Clark and her husband Garfield of Goshen, William and his wife Christina of Castleton, New York, Robert of New Hampton, James and his wife Lori of Goshen, Thomas and his wife Melody of New Hampton and Susan Jacks of Westtown, New York, sisters; Eleanor Ogden of Circleville, and Marjorie Armes of Goshen, seventeen grandchildren: William, Michael, Dirck, Jennifer, Whitney, Allison, Jason, Andrew, Matthew, Joanne, Jake, Jimmy, Sarah, Lindsey, Jill, Kevin and Stephanie and 23 great grandchildren, and many nieces and nephews. She is predeceased by her husband John, and her grandchildren Jackie and Jeremy, son-in-law David Jacks, and great grandchild, Atticus, and brother John Lutjens. The family wishes to thank those at Carlucci’s Home for Ladies who lovingly cared for mom over the last few years. Visitation will take place on Sunday, March 31, 2019 at Applebee-McPhillips Funeral Home, 130 Highland Avenue, Middletown, New York from 2 to 5 P.M.
A Service of Remembrance will take place on Monday, April 1, 2019 at Applebee-McPhillips Funeral Home at 11 A.M, with Pastor Robert Keene officiating. Burial will follow in the family plot at Ridgebury Cemetery, Ridgebury, New York. Funeral Arrangements have been entrusted to Applebee-McPhillips Funeral Home, Inc.
To send flowers or a remembrance gift to the family of Suzanne M. DeBlock, please visit our Tribute Store. "Email Address" would like to share the life celebration of Suzanne M. DeBlock. Click on the "link" to go to share a favorite memory or leave a condolence message for the family.